Set the perfect mood with your home lighting with the versatile Philips Hue smart lighting solution. Philips Hue continues to lead the way in smart-lighting solutions. Philips Hue is the tech company’s branding for its connected lighting family of products. Though there are a number of manufacturers producing smartphone-controlled lights today, Hue was the first of its kind when it debuted all the way back in 2012 and has since gone on to secure a market-leading position. The main competitor to Philips Hue is LiFX and to a lesser extent Belkin’s WeMo but what sets Hue apart from the others is that it works with just about every smart home platform you can think of. For example, you can use a Samsung SmartThings Motion Sensor to turn your Philips Hue light on and off when motion is detected in your home. Philips Hue is one of the few smart lighting systems that support Apple’s HomeKit – the set of smart home controls built into the software that powers iPhones, iPads and Apple TV. This means that you can tell Siri to change your Philips Hue bulbs to a lighting scene that matches your mood. There’s support for Amazon Alexa and Google Assistant as well. The Philips Hue Bridge, which is required in order for the Hue lighting products to work, can also act as a hub for other smart bulbs that use the ZigBee wireless light link standard such as IKEA’s Tradfri lighting range. What is an LED smart bulb? A smart bulb essentially replaces your existing incandescent bulb with an LED light bulb that can be controlled from a few taps of your smartphone, tablet or your voice. Smart bulbs can be dimmed and some models allow the colour temperature to be adjusted so you can go from a harsh white light of 9,000K to a very warm and inviting soft glow of 2,500K. Hue white and colour ambiance bulbs are capable of generating 16 million different colours and can be put to a schedule so that the lights will change colour to match the time of day. Smart bulbs like those sold by Hue are more expensive than traditional incandescent bulbs; however, they do consume significantly less energy and last a lot longer, with a rated lifespan of 25,000 hours. This translates to 23 years based on three hours of daily usage. Another point worth mentioning is that the maximum light output of a smart bulb is measured in lumens as opposed to watts. Most of us know the brightness of a 60-watt bulb compared to a 100-watt bulb, but watts measure how much energy a bulb uses to produce light, not how bright the light is. Lumens provide a more accurate presentation of how much light your bulb can produce. Philips Hue light bulbs use a 10-watt bulb in their Hue lighting products and can produce 800 lumens of light which is roughly equivalent to the light output of a 60-watt incandescent bulb. Basically the more lumens, the brighter the light. 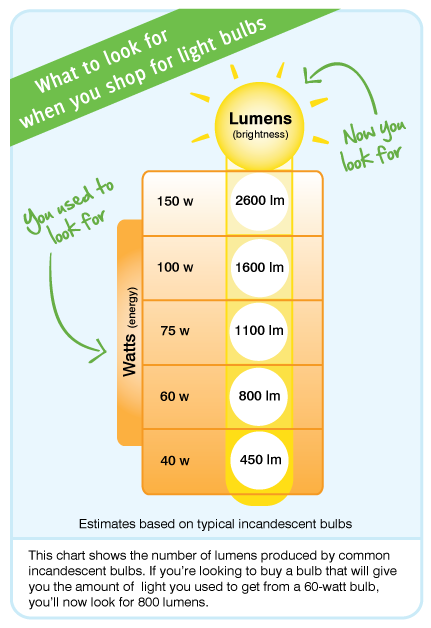 Here’s a handy chart that runs through the number of lumens produced by common incandescent bulbs so you have a better idea of what sort of light output to expect the next time you’re shopping for LED smart bulbs. Since introducing its Hue lighting system, the Amsterdam-based electronics giant Philips has expanded its lineup to include quite an arrangement of light bulbs and light fixtures to choose from. The local Hue range mightn’t be as broad as it is in Europe but it does at least cover the essentials. Here’s a rundown of all the Hue products currently available in Australia. If you don’t need the fancy colours, the Hue White bulb is a reasonable option for frugal shoppers. It produces a soft white light and while the temperature of the light cannot be changed, it can at least be dimmed like any other Hue bulb and you can set light schedules based on the time of day. The Hue White Ambiance sits between the Hue White and Colour Ambiance and the Hue White bulb. It doesn’t allow you to change to different colours but it does change temperature, from a warm soft white to a bright daylight. The Philips Hue White and Colour Ambiance bulb does everything the Philips Hue White Ambiance bulb can do with the addition of being able to produce 16 million different colours to instantly change the look and atmosphere of the room. The White and Colour Ambiance bulb supports a number of additional features such as the ability to sync music and movies, enabling the Hue light to respond to every dramatic moment, while “wake-up” mode mimics the effect of a sunrise by gradually increasing the light brightness which can help wake you up naturally. Philips Hue White and Colour Ambiance also comes in a GU10 shape bulb for areas of the home that use recessed lighting. The Lightstrip Plus is a flexible strip of small LED lights that can be shaped around corners and attached to any solid surface using the adhesive tape on the back. It’s typically used behind desks or an entertainment centre where the light is then bounced off the wall to produce a colourful glow. It can also be used to integrate into furniture, under kitchen cabinets or highlight architectural features with smooth indirect light. The Lightstrip Plus is capable of producing a light output of 1,600 lumens which is roughly the equivalent to the brightness of a 100-watt bulb and can generate 16 million different colours. Like the Hue colour bulbs, the strip can be synced to movies and music and wake-up modes. The Lightstrip Plus is two metres in length but you can buy a 1m extension strip (sold separately) if you require a longer run. Note that the Lightstrip Plus requires power so it will need to be installed near a wall outlet. The Philips Hue Go is a small portable light that can either be plugged into a power outlet to colour the walls inside your home or you can detach it from the mains and take it with you while on the go. Philips says that the internal rechargeable battery can last up to three hours and can be fully controlled with your smart device. It uses a 6W LED and, as such, isn’t as bright as the dedicated bulbs with a maximum light output of only 300 lumens. The Tap Switch is a completely wireless solution that allows you to control your Philips Hue lights using physical buttons. On the back of the unit is an adhesive tape that can be used to mount the Tap in any location or you can remove the back plate and use screws instead. Alternatively, you can simply use it as a remote control that travels with you as you move around the house. The Hue Tap doesn’t use batteries to garner power. Instead, it cleverly utilises kinetic energy gained through button clicks on the unit itself. Philips says that the Hue Tap is good for 50,000 clicks, so even if you clicked the Tap 10 times a day, that’s still over 13 years of usage. There are four physical buttons that you can assign to your four favourite Hue light settings or you can program a button to simply switch all of the lights off like a traditional light switch. Like the Tap, the Hue Dimmer Switch can either be mounted on a wall or carried around and used as a remote to turn the light on, dim it or turn it off. However, unlike the Tap, the Dimmer Switch uses a user-replaceable battery. The Dimmer Switch is also sold as part of a wireless dimming kit which throws in a Hue White bulb. The nice part about this kit is that you don’t need a Philips Hue Bridge to get the dimmer working with the included Hue bulb. It is designed to work straight out of the box with no additional accessories required. However, you’ll still need to buy a Hue Bridge (sold separately) if you want to control the bulb with the Hue app on your smartphone or tablet. The Philips Hue Bridge acts as the brains of the entire Hue ecosystem of connected lights and is capable of controlling up to 50 Hue lights. In other words, Hue lights will not operate without a Hue Bridge connected to your home network. The Hue Bridge is a very small unit and can easily be hidden from view; however, it will need to be set up near the router as it requires a wired network connection. As the name suggests, if you’re new to Philips Hue, a starter kit is the best place to begin as it comes with the requisite bridge device and some Hue light bulbs. A recent update now sees the inclusion of a dimmer switch included with two of the three starter kits available. The cheapest option is the Philips Hue White starter kit which comes with the bridge and two Philips Hue White bulbs. If you like a bit of versatility with your white light, the next level starter kit includes the Bridge, two Huw White ambience bulbs and a dimmer switch. For complete lighting control, there's the Hue White and Colour Ambiance starter kit nets you three Hue White and Colour Ambiance bulbs and a bridge, plus a dimmer switch.